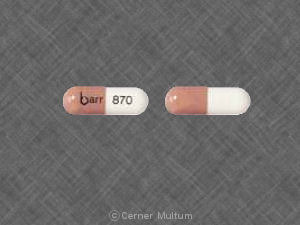 Fareston is a novel SERM - Selective Estrogen Receptor Modulator (anti estrogen) that is supposedly more powerful than Nolvadex and may have less side effects than other anti estrogens. It also lowers bad cholesterol (LDL) and increase good cholesterol (HDL). Primarily used to treat breast cancer in post-menopausal women, it has a great a potential to be used in men as well for various medical conditions. Since Fareston (Toremifene) has been in market but much less time than Nolvadex it has fewer medical studies. 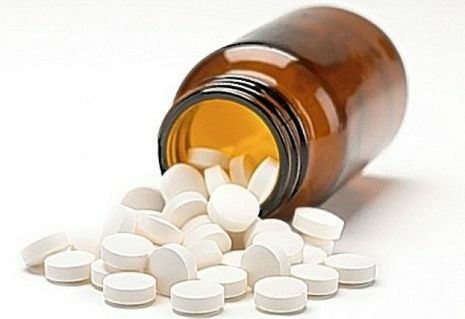 However due to similarities in action with other SERMs like Nolvadex though being more potent it has probably even greater potential to treat the same conditions doctors use Nolvadex to treat. Treating breast cancer in women past menopause with estrogen-dependent tumors or unknown tumors. It may also be used for other conditions as determined by your doctor. 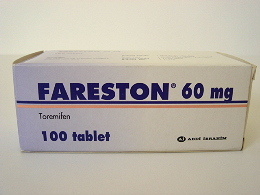 Fareston is an antiestrogen. It works by blocking the effects of estrogen on certain body tissues, including breast tissue. This helps block the growth of estrogen-activated tumors. Toremifene is used as adjuvant hormone therapy immediately after surgery in early stages of breast cancer and also to treat advanced metastatic breast cancer (stages III and above) in postmenopausal women. Postmenopausal women at high risk of developing breast cancer may take toremifene to reduce risk. Toremifene belongs to a family of compounds called antiestrogens. Antiestrogens are used in cancer therapy by inhibiting the effects of estrogen on target tissues. Estrogen is a steroid hormone secreted by granulosa cells of a maturing follicle within the female ovary.